The National Weather Service has issued an excessive heat warning for the region from noon today through 8 p.m. Wednesday. The warning could be extended further into the week due to worsening conditions forecast. The combination of high heat and humidity during that period will make it feel like temperatures have exceeded 100 degrees throughout the week. 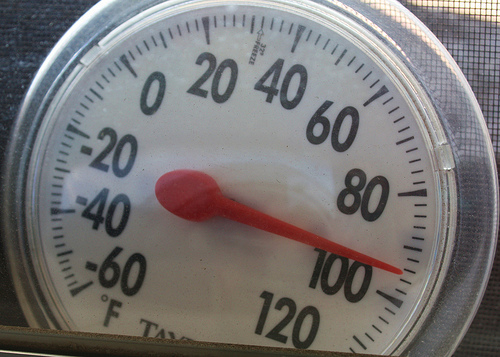 The forecast calls for actual high temperatures in the mid- to upper-90s through to Saturday. Showers predicted for Saturday may bring Sunday’s high temperature down to the mid-80s, the weather service reported. Low temperatures during the week will be in the 70s. Friday’s predicted low is 79 degrees. According to the excessive heat warning, the highest heat indexes — between 100 and 103 degrees — will occur between 1 and 6 p.m. between today and Wednesday. However, heat indexes up to 105 could be experienced Thursday and Friday afternoon. “The excessive heat will create dangerous conditions – especially for those working in the sun or living in non-air-conditioned homes. The most adversely affected are young children and adults over 50. Leaving anyone – including pets and children – in non-air-conditioned cars during the day is very dangerous and quickly can become fatal. This entry was posted on July 15, 2013 by Barrington Bulletin in Region, Safety and tagged heat.